Though the new Apple Watch Series 2 looks largely the same as its predecessor, there are a number of subtle improvements to the hardware beyond the addition of GPS and a brighter screen. 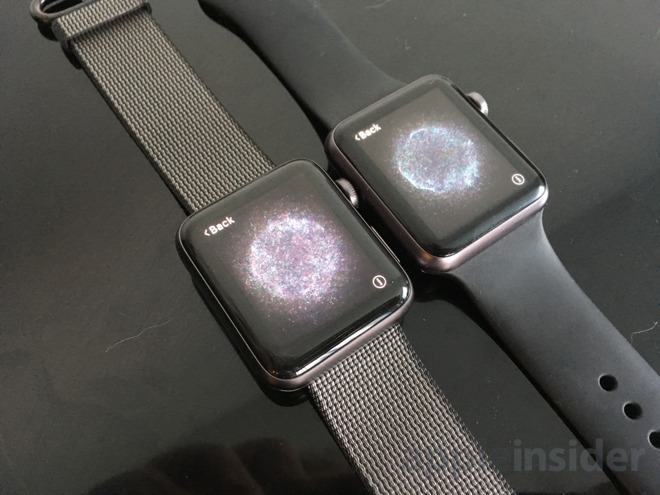 AppleInsider offers a first look at the newly released wearable. Left: Apple Watch Series 2. Right: First-generation Apple Watch. Most of the changes for the new second-generation Apple Watch are found on the inside, as highlighted by Apple in the product's announcement last week. Namely, they are a new waterproof design, as well as the inclusion of a GPS radio for pace and distance tracking while exercising. Another standout feature is the improved display, which is twice as bright as the first-generation Apple Watch. Beyond these changes, however, there are a few other things Apple didn't specifically highlight in unveiling the Apple Watch Series 2. 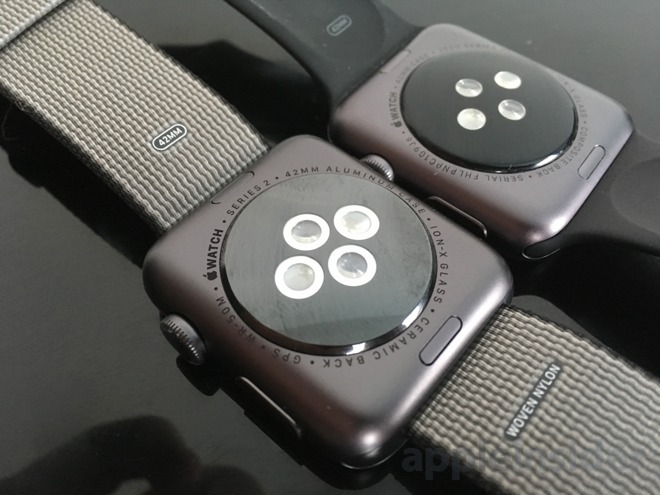 AppleInsider got their hands on a space gray Apple Watch Series 2 Sport with black nylon band on Friday. The back of the device has a few key changes over its predecessor, most noticeably silver rings around the lights and scanners that make up the device's heart rate monitor. 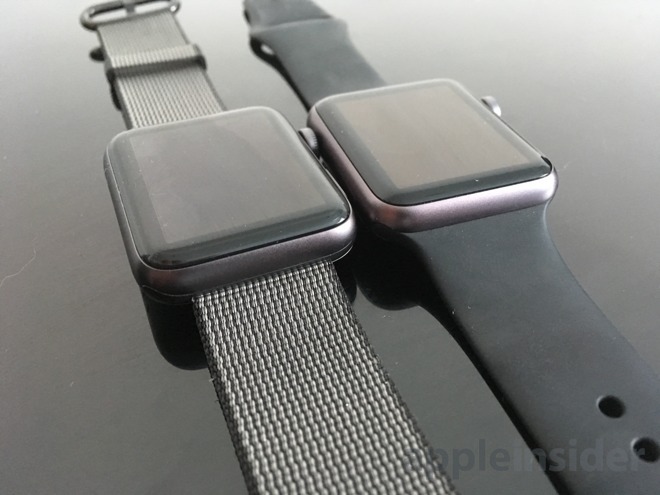 The text around it, too, reveals another change: The Series 2 watch now has a ceramic back, an improvement from the composite back of the first-generation model, and matching the material from the first-gen stainless steel and Edition models. The new Apple Watch Series 1 Sport with S1P dual-core chip retains the less expensive composite back. 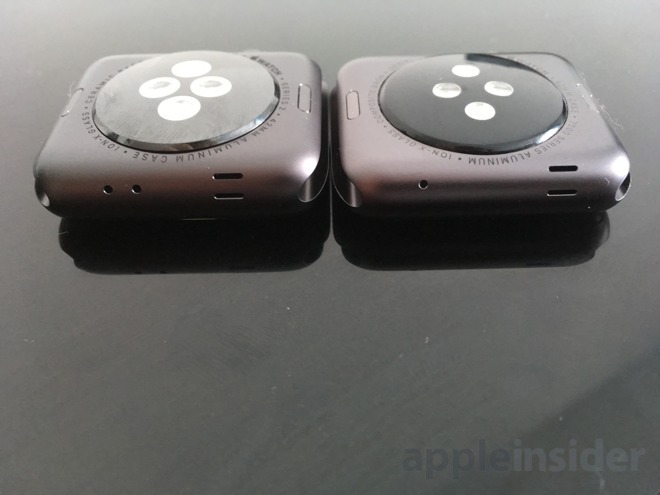 On the left side, the Apple Watch Series 2 reveals another change for this year's model: A second microphone hole has been added. Presumably this hardware revision will allow for better voice recognition for functions like Siri and fielding phone calls. 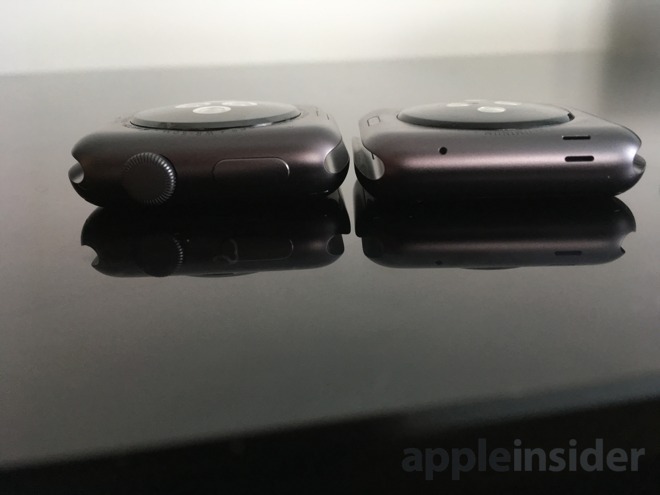 The Apple Watch Series 2 hardware is ever so slightly thicker than the 2015 model, though without placing the device side by side, most users would never even notice the difference. When worn on the wrist, the new Sport version looks essentially identical to its predecessor. The screen is also brighter on the new model, though admittedly we never found ourselves having serious issues with the clarity of the first-generation model. As expected, virtually all accessories designed for the Apple Watch to date should work with the Series 2 version. That includes bands (both first- and third-party), as well as charging cables and docks. AppleInsider will have much more on the Apple Watch Series 2 in the coming days and weeks, including our full review of the new wearable.